Addiction Helper go beyond just substance abuse and behavioural addictions. We also offer free advice, referrals and private treatment to clients suffering from eating disorders such as Bulimia; clinically known as Bulimia Nervosa. Interestingly enough, patients with eating disorders suffer from many of the same underlying issues commonly associated with substance addictions. They are addicted to the maladaptive behavioural issues they have around food. The treatment that works well for addiction to substances and behavioural addictions, also works well for those suffering with Bulimia and also other eating disorders. If you are visiting the site because you have a concern that you or a loved one may be suffering with Bulimia, we can help, there is no need to continue worrying and wondering. By contacting us on our 24-hour helpline, you will instantly have access to all the information you need to make an informed decision as to how to access the most appropriate treatment. We will talk you through all of your options following an in depth comprehensive assessment on the severity of your or your loved one’s condition. If you do need immediate help and treatment for yourself or loved one, we can refer you to an appropriate private rehab clinic, support group, counsellor, or another service provider. We understand that this is a life threatening illness; failing to address it correctly with the correct professional Bulimia treatment could end up with disastrous and irreversible damage to the individual’s health, which could lead to a coma and death. Clinically referred to as Bulimia Nervosa, Bulimia is a severe and life threatening eating disorder similar to Anorexia in some ways, especially the psychological aspect of the illness, but decidedly different in the physical symptoms and manifestations. Like Anorexia, those that suffer with Bulimia, a recognised mental health disorder, have an unhealthy obsession with their own body image. They often also suffer from BDD Body Dysmorphic Disorder. The biggest difference between and Anorexic and a Bulimic is that Bulimics will binge on large amounts of food in secrecy and then purge, either through vomiting, use of laxatives or excessive exercise. More often than not, most Bulimics will use a combination of different ways of purging but have one particular method that they use the most often A Bulimic will crave food obsessively and once they start eating find it very hard, if not impossible, to stop until they reach a point where they physically cannot fit any more food in their stomach or are in pain. In this sense it is also similar to someone suffering from compulsive overeating. Bulimia is a very secret illness and most will present a normal body weight. Bulimics are very ashamed of their behaviours and often see themselves as disgusting with very low self-esteem. They will go to great lengths to cover up their Bulimic tendencies. Please read on to find out how to spot the signs and symptoms of Bulimia and how to obtain a clinical diagnosis of this illness. Forced Purging – The individual compensates for their compulsive binge eating through self-induced vomiting, laxative abuse or the abuse of diuretics. In the most severe cases a bulimic will use all three methods to purge the food consumed from their body. 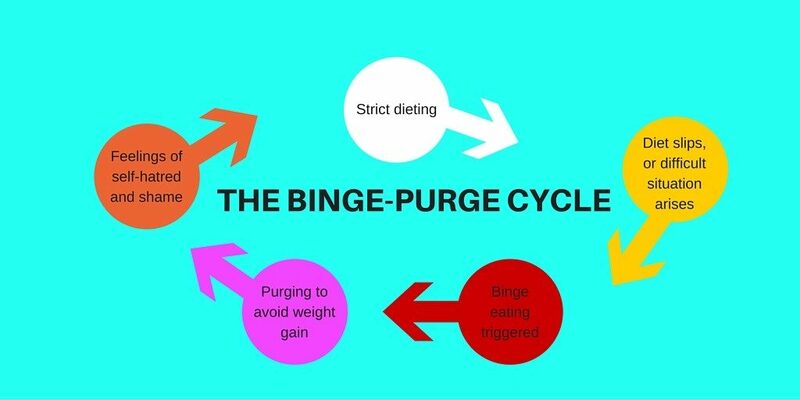 Non-Purging – The non-purging bulimic still binge-eats compulsively but compensates for it by undergoing regular fasts or engaging in excessive volumes of exercise. It is not uncommon for a non-purging bulimic to be as obsessed about exercise as she/he is about maintaining the ‘ideal’ body weight. 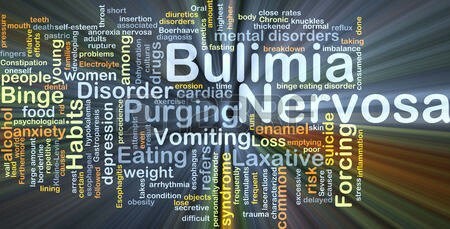 The important thing to understand about Bulimia, is just because the individual may well present a normal body weight, does not reflect the damage they are doing internally to their organs, their mental wellbeing and the impact Bulimia has on essential vitamins required to keep the body operating as it should. 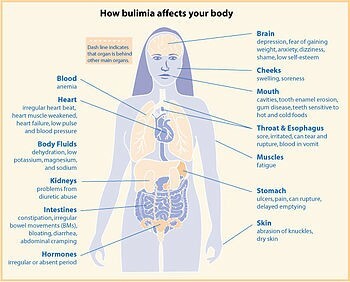 Please read on for further information on the damage Bulimia can cause physically. A report commissioned by BEAT, the UK’s leading charity for information on eating disorders, estimates that in 2015 more than 725,000 people in the UK were affected by a type of eating disorder. We feel that due to the shame and secrecy the individual experiences with the illness of an eating disorder and the associated stigma attached, that the actual figure could indeed be much, much higher. Many fail to admit that they have a problem or seek help, at least until it reaches a crisis point. The Health and Social Care Information Centre published figures in February 2014 showing an 8% increase in the number of inpatient hospital admissions in comparison to the previous 12 months. The costs of eating disorders report found that this is representative of the identified trend in increasing prevalence over time: a 34% increase in eating disorder related admissions since 2005-06 – that’s approximately 7% to 8% each year. Sadly the NHS do not have the intensive rehabilitation facilities available for those suffering from an eating disorder. At the most they can offer hospital inpatient admission to those in critical condition, along with a referral to psychiatric care and an Eating Disorder Association. We feel that it is important that someone with an eating disorder receives inpatient psychological support and intensive therapy to deal with the root causes of their eating disorder within a safe, supportive and therapeutic environment. Correcting or treating the physical problems does not deal with the illness, which resides within the individual’s mind: in their thinking, false belief systems, obsessions, compulsions and delusional perspective of themselves and what quantifies healthy eating and body image. The National Institute of Health and Clinical Excellence estimates around 11% of those whom are affected by an eating disorder are male. The vast proportion are female, but men who suffer tend to take longer to admit that they have a problem and see seeking help for their illness as a sign of weakness. The real figure again could potentially be much higher than reported. Recent research from the NHS Information Centre showed that up to 6.4% of all adults displayed signs of an eating disorder (Adult Psychiatric Morbidity Survey, 2007). 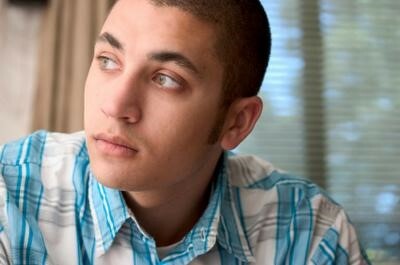 This research suggested that up to 25% of those showing signs of an eating disorder were male; this is more likely to be nearer to the reality. The latest version of the DSM (Diagnostic Statistic Manual of Mental Disorders) states the main eating disorders as anorexia, bulimia and binge eating disorder (BED), eliminating EDNOS (eating disorder not otherwise specified). Before the latest change in diagnostic criteria, it was estimated that of those with eating disorders, 10% were anorexic, 40% were bulimic and the rest fall into the EDNOS category which included binge eating disorder. This indicates that Bulimic rates are very high and is the most common eating disorder along with binge eating disorder. What Is the Most Common Age Group for Bulimia to Develop? Bulimia usually develops in both men and women during the teenage years; some will outgrow the illness, others will have the illness for life. However it can be triggered at any stage in an individual’s life. Bulimia can affect anyone, regardless of age, gender, social class, religion or upbringing. Some individuals will suffer from all three of the main eating disorders at various stages in their life, perhaps starting out as anorexic, then turning to binge eating and then bulimia, as an example. Professionals are able to clinically diagnose bulimia thanks to some very definite signs and symptoms. Things may not be so easy for the non-professional or someone inexperienced in dealing with eating disorders. To make this more understandable, we have divided the signs and symptoms into two categories: those to look for in yourself and those you might see in someone else. Excessive fear of gaining weight – the thought of gaining weight terrifies you to the point that you will go to extreme lengths to purge food consumed. Having to sit with food inside of you and not being able to purge due to circumstances, will make you feel very uncomfortable and distressed. You may well wake up each morning, swearing that you are not going to eat or binge, but failing, binging and then subsequently purging once again. Excessive fear that you cannot control your eating habits – You fear that you are unable to stick to a healthy eating plan and will gain weight and that Bulimia is the only solution to your lack of control around food. A tendency to binge eat rather than eating normal meals and snacking – Many Bulimics will try and go without eating until the point where they are planning a binge. Some binges are preplanned, others happen when a Bulimic feels they have over eaten and so carry on so they can then purge. Their desire is often to fast like an anorexic, but their eating habits are more closely matched to the out of control eating of a binge eater. Routinely and compulsively eating to the point of pain or discomfort – Once you have started on a binge you will find it impossible to stop until continuing becomes painful and or you feel sick; at this point you will know it will be easier to induce vomiting. Repeated induced vomiting can result in a damaged gag reflex. If this happens you may resort to sticking pens, toothbrushes or even coat hangers down your throat through sheer desperation to vomit. Forcing yourself to vomit or engaging in excessive exercise after eating – This action is to compensate for the calories consumed during a binge, to reset the body as it were. Often after a purge you will feel cleansed and more relaxed. Using laxatives, diuretics or enemas after eating – Again this action is to rectify the calories consumed during a binge. For a Bulimic not to purge after a binge is extremely distressing and causes immense fear. Excessive use of diet supplements or herbal products for weight loss – The obsession to lose weight and regain control over eating means many Bulimics will resort to trying various non-medically approved and non-prescribed appetite suppressants or fat burners. Repeated binge eating – This includes foods a person would have previously avoided. You may find evidence of hidden wrappers, shopping receipts, vomit residue in the toilet bowel and packets of diuretics and laxatives. Tooth decay, gum disease (from routine forced vomiting) – The acid produced by the stomach after induced vomiting causes severe damage to the teeth and gums. Even regular tooth brushing will not prevent this from occurring. Obsessively exercising – usually on a daily basis and to the extreme. Even in their bedroom alone, they may well be exercising frantically to burn up calories. Excessive tiredness – Bulimia takes its toll on the body, yet they may struggle to sleep. Lack of nutrients and essential vitamins will lead to chronic fatigue. For the purging bulimic, the danger is exponentially worse. Not only does bulimia rob the body of valuable nutrients, but the forced purging can also cause significant physical damage. For example, routine forced vomiting can cause stomach ruptures, oesophageal ruptures and sores, severe dehydration, and other problems. Long-term bulimia can eventually lead to death through starvation, heart attack, dehydration, and a number of other conditions. Bulimics are particularly susceptible to low potassium levels which are required to regulate the heart and keep it healthy. Very low potassium levels can lead to heart attack or heart failure. If you suspect that a loved one or family member is suffering from Bulimia, it is important not to ignore the signs and symptoms. As a recognised mental health illness it is unlikely to get better by itself and without the correct medical/professional help and treatment. Bulimia tends to get progressively worse and the longer it goes on for, the more dangerous it becomes for the individual suffering. Educate yourself around the facts of Bulimia, the signs and symptoms and the impact it has on the body. Understand that the individual is very mentally unwell and that this will be a very sensitive subject for them. It is vital you do not judge them when speaking to them about the illness. Look into treatment options before approaching the subject; if they do admit they have a problem you are at least then armed with a solution to help them. Support them in asking for and accessing help, reassure them that they can get well and you will help them if they are willing. If they do admit they have a problem, and ask for help, act without delay, before they go back into denial or claiming to have it under control. Stick to the facts and evidence which has led you to believe they have a problem; be gentle and sensitive in your approach and not attacking or this will put your loved one on the defensive and may destroy a future opportunity of helping them. If after trying these suggestions, your loved still refuses to admit that they have a problem or won’t seek help, call us for further assistance. If they do ask for help we can arrange for them to be promptly admitted to a private residential treatment centre where they will receive appropriate and intensive treatment for their condition. Addiction Helper only work with CQC regulated rehabilitation clinics for eating disorders. We can assist you in finding the best help possible for your loved one in order for them to get well and maintain their recovery. Where Can I Find Help and Treatment for Bulimia? Bulimia is a very serious condition requiring immediate medical and psychological intervention. As with other eating disorders, therapists and doctors must utilise a multi-disciplined approach to treating this condition. Treatments should be both physical and psychological. To begin with, Bulimia can be treated through an outpatient programme as long as the patient’s health is not in jeopardy and the condition is not too severe. Otherwise, hospitalisation or inpatient treatment at a private rehab clinic will be required. If the individual also suffers from an addiction, such as alcohol, drugs or prescription pills, all conditions presenting must be treated simultaneously in order to avoid a recurrence of either in the future. The first course of action with an individual suffering from Bulimia is to begin to restore nutritional balance so that the body can do as much as possible to heal itself. A specialised eating plan should be individually developed so that the Bulimic feels they are able to cope with ordered and healthy eating; this may mean removing foods that they identify as trigger foods to a binge. Some examples of this may be particular types of bread or foods high in sugar or fat. Once the physical aspects of Bulimia are under control and the bulimic is following a healthy non triggering eating plan and abstaining from purging, therapists can then turn their focus to the psychological and emotional issues that accompany an eating disorder. Therapies employed in this regard are designed to help uncover what triggered the Bulimia; more often than not the trigger is some sort of unusual stress, trauma or a dysfunctional family unit. With the trigger uncovered, therapists can begin working with the individual to overcome it. Sometimes there can be no identified one particular trigger, but the Bulimic will still have to undergo a profound change in their thinking and how they handle their emotions and potential triggers in future. Our specialised eating disorder rehabs address both the physical and psychological/emotional aspect of Bulimia, so that a full and maintainable recovery is possible. CBT – Cognitive behavioural therapy (CBT) has proven very effective for the treatment of Bulimia. This treatment is designed to identify negative and incorrect thoughts, beliefs, and emotions. Those negatives are then corrected by working through a series of predetermined goals. The qualified therapist will challenge the patients thinking and suggest a healthier and more realistic perspective. Interpersonal Therapy – This counselling based therapy in person centred and seeks to identify any relationship difficulties the patient may have that could trigger the kinds of thoughts associated with Bulimia. Improving those relationships should ward off future episodes of Bulimia. The Counsellor will use a combination of evidence based and highly effective therapeutic techniques in order to gain the best possible results from their sessions. It is vital that the individual is treated from a person centred approach and as a whole person. Family Support and Counselling – Family counselling can be tremendously helpful by equipping parents, partners and significant others with the knowledge that they need to interrupt future episodes of Bulimia and recognise the early warning signs. The patient can also regain a suitable amount of control over eating habits with the support of family members. If an individual is returning back home after treatment to a family unit, all the family will need to support the individual’s recovery and appreciate the seriousness of this illness. Please do not hesitate to get in contact with us if you believe you or a loved one is suffering from Bulimia. This is a condition that will not go away by itself. It is also one that can prove fatal if left untreated. Addiction Helper work with over 100 CQC private rehab clinics in the UK of an exceptional standard in terms of the clinical and therapeutic care they provide to their patients. All rehabs are staffed by qualified addiction specialist Doctors, Counsellors, Psychotherapists, Holistic Therapists and Support Staff. For an individual who is suffering from Bulimia, we feel it important that they access one of our rehabs that specialise in the treatment of eating disorders for the best results. Where another addiction is present, the vast majority of our rehabs are able to provide effective and quality treatment for both conditions. It is important to us that you or your loved one are able to attain permanent recovery; we will do our utmost to find you the best rehab to treat your individual condition. For those with severe Bulimic tendencies, we have rehabs that are staffed 24/7 with medical and nursing staff. Especially in the early stages of treatment the Bulimic will need to be monitored very carefully and closely. We therefore recommend inpatient rehab treatment as the best possible treatment option. Furthermore for all patients that complete their treatment programme with us, we provide 12 months complimentary aftercare that they can attend at the rehab, usually on a weekly basis. We will tailor the inpatient treatment programme to meet the individual’s specific treatment needs; this may include extended day care after an inpatient programme, secondary care and tertiary care. There is no quick fix to Bulimia, it takes time, adjustment and practising of the tools acquired whilst in treatment. The Bulimic must be willing to maintain these practices and use the tools of recovery we provide them with in order to stay abstinent from their particular eating disorder and the associated maladaptive behaviours. No two individuals are the same, we recognise this and so each treatment is tailored specifically to target the individual’s issues and problems. If rehab is not an option or not affordable, we will point you towards the correct sources of help and support locally that are free or on the NHS. Addiction Helper are passionate about saving lives and the work we do on a daily basis. By calling us you will receive a free comprehensive assessment of you or your loved ones treatment needs before we suggest the most appropriate treatment options available for your particular problem. Our telephone lines are open 24/7 and staffed by very experienced and highly trained addiction treatment experts. We will support you and your family every step of the way. Don’t delay accessing treatment for this life threatening eating disorder. 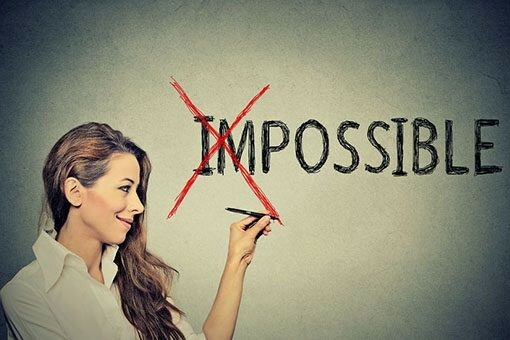 Call us today for support and information on how we can best help you take the first step towards a full recovery and complete freedom from Bulimia!